New Vision Medical Professions is a one-year program offered to highly motivated high school seniors. As a healthcare field immersion program, students will explore related career pathways as they participate in scheduled rotations at Cortland Regional Medical Center. Students will experience firsthand the medical profession working with physicians, nurses and other health professionals. Through a combination of research and hands-on projects, students will learn about medical ethics, patient rights, human anatomy and physiology, governmental regulations, and health careers. 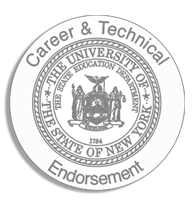 Another integral component of the program is the dual credit course in English 101 through Tompkins Cortland Community College, in addition to CPR certification. Students will also fulfill their English 12, Participation in Government, and Economics requirements toward graduation. Eligibility requirements: Interested students must be in their senior year of high school, in good academic standing and on target with all graduation requirements. Eligible candidates should exhibit self-motivation, enthusiasm and maturity, and must be willing to work both independently and as a team member in diverse settings. Nearly half of all medical school grads are women, up from 20% in 1977.